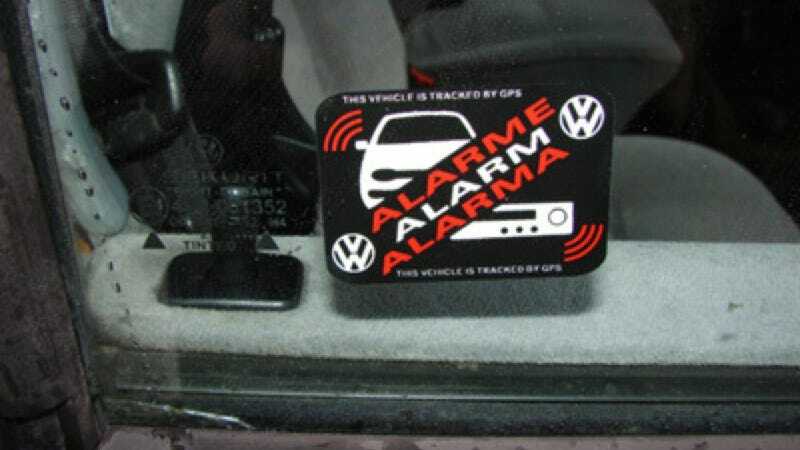 Alarm systems are commonplace now, as pretty much every car has one or is available with one from the factory. And they honk and wail when someone bumps into your car outside Chili’s and no one bothers to notice your car screaming. They are more annoying than they are useful, but at least if you have one you used to be able to brag about it. That's not the case anymore, as the cool stickers in the side windows of cars to tell everyone you had a factory alarm are pretty much gone. Back in the '80s and '90s, manufacturers went to big lengths to create some attractive stickers placed in the windows of your car to tell would-be thieves that this 5-series is going to scream bloody murder if you smash a window. It was likely a tall sticker, maybe even some red letters or an orange triangle thrown in. Nice, right? Remember when theft devices in radios was a big thing? This (faded) Mercedes sticker off of one of their models from the '80s is big and bold and tells you the radio is a no-go if you break into this Benz, swipe the stereo and try to stick it into your Nissan Sentra. Oh, and the alarm would blare and everyone would see you in someone else’s 300E. I'm having a hard time thinking of the last new car I saw with a sticker indicating it had a factory alarm. I know my Volkswagen Golf GTI has an alarm, but there are no stickers to explain what the blinking red light on the dash is. I’d love something large and kind of ridiculous like electrocuted burglars with spiky hair running away from a GTI shape. I think VW could shift some more cars if they looked back at their pages from history and revived some classic window decals. This Porsche one from the early '90s is pretty tame, but at least it was something and had PORSCHE in big letters. But hey, if I get into a brand new 911, what’s going to tell me it has an alarm? Actually, being a Porsche, the alarm is probably a $4,000 option, but you know what I’m getting at. What are your ideas for some awesome alarm window decals that need to make a comeback? Go with me on this one, because new car windows are just so plain.